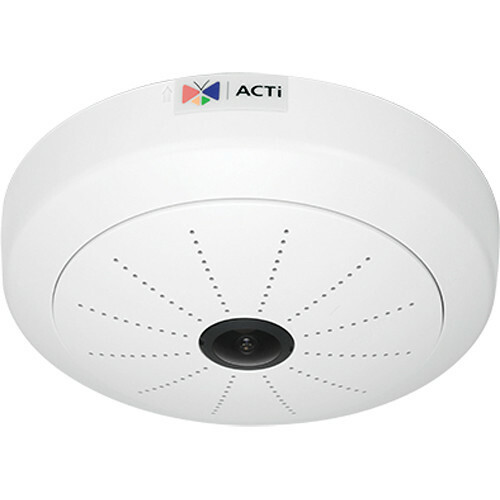 The 5MP Hemispheric Dome Camera from ACTi features a 1.05mm fixed fisheye lens, providing a 180° overview and a 109.8° view of highly detailed areas. With a 1/2.5" progressive-scan CMOS sensor, the camera captures images at a maximum resolution of 2592 x 1944. It features a mechanical IR cut filter for true day/night functionality, automatically switching between color and B&W images for clear details. The camera uses both H.264 and MJPEG formatting for maximizing your storage and bandwidth, and a microSD slot allows for on-site recording with edge storage. Additionally, input and output terminal blocks provide 2-way audio capability. The camera can detect motion in up to three programmable areas, and it will also set off an alarm if sound is detected. Once an alarm is triggered, the camera will send you an email with a snapshot of the situation or save a video of the incident to your local storage. There are four configurable privacy regions for customizing your field of view, and brightness, contrast, and sharpness settings allow you to configure your camera based on various environments. The RJ45 Ethernet connection uses PoE technology for a simple installation, and the camera can be surface, flush, wall, pendant, pole, corner, or gang box mounted for multiple setup options. ONVIF compliance enables compatibility with a wide range of surveillance devices, allowing you to connect the camera to an NVR for additional storage and management features. Box Dimensions (LxWxH) 7.9 x 7.85 x 3.5"